The Bully Fire, which has burned more than 12,600 acres in Shasta County, is nearly contained. 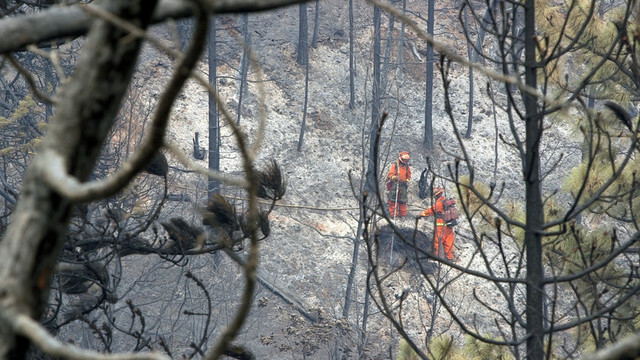 In the two weeks since it ignited, about 2,000 firefighters have battled the blaze. Nearly half of them -- 900 -- are inmates with the California Department of Corrections. These "low-level offenders" making just $2 an hour are a crucial component in how the state battles wildfires. "First day we was out here it was like 111 or 115 and that’s not including the fire," says Emir Dunn. His orange fire suit swamps his slender body, but don't be fooled by his size. Like most inmate firefighters he lugs more than 100 pounds of gear with him: an axe, food, water, fuel for the chainsaw. The air tastes like a charcoal briquette. The wind picks up, and a mix of dirt and ash swirl from the ground. Dunn scours the scorched area looking for embers that could reignite. He sees smoke billowing from the ground. He readies the hose and he and a crewmate blast the smoking mound with water. Dunn and 15 others will stay here for a 24-hour shift. They might catch some sleep, but very little. They hiked up here and they'll hike back to the pick-up point, a slog that's likely to be several miles. Each crew has one professional firefighter, a captain, and the rest are men convicted of crimes including drug offenses and armed robbery. Captain Josh Kitchens looks like he came straight out of central casting: tall with a chiseled jaw and the stare of someone who doesn't play around. He runs Dunn's crew. He's pretty much alone with inmates wielding axes and chainsaws in the middle of a forest that happens to be on fire. But he shrugs it off. "It’s just like working with any other group of guys," he says. "You kind of get to know their personalities and what they're capable of and you put them in positions most suited for them." Before he was the captain of this crew Kitchens was a more traditional firefighter, but he says he signed up to oversee an inmate crew five months ago to expand his experience. And he's impressed with their work ethic. "These guys are some workhorses," he says. "When it’s time to do some grunt labor, that’s what we’re good at. Get a lot of stuff done with 16 bodies." California's Department of Corrections and Rehabilitation has prisoners and Cal Fire needs firefighters. 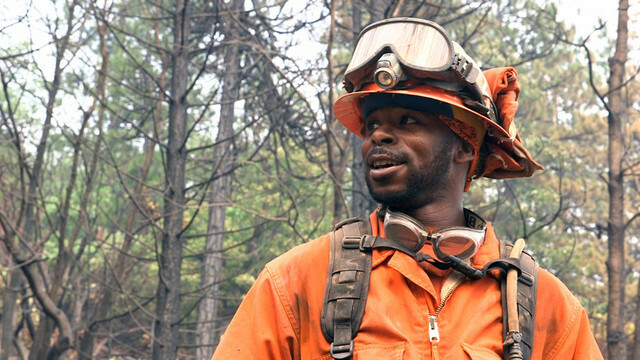 Across the state there are more than 4,000 inmate firefighters. Their labor saves the state more than $100 million a year, according to CDCR. As far as whether the program affects recidivism, corrections officials say they don't have hard numbers. Anecdotally though, they say they see fewer of these guys back behind bars than those in other programs or straight out of a prison. Down the mountain from the Bully Fire, at base camp, inmate Cory Sills is resting after a 24-hour shift. He says he thinks the camps are a success because they're completely different from prisons. "There’s an assembly where we have a formation in the mornings and it was like my second or third day and the lieutenant comes out and he goes, 'Look, we’ll treat you like men first, firefighters second and prisoners if we have to,'" Sills recalls. "That right there, that stuck in my head for two years now because now I have a chance to be treated like a man." There are guards at the base camp, but you won't see guns, truncheons or barbed wire. On-site warehouses and large white makeshift tents, cooled with fans and air conditioners, are sleeping quarters. There's a medical tent used by both professional firefighters and inmates. Most here are being treated for poison oak. Then there's the food: it's hearty, to keep the inmates fueled for the rough work. Base camps and fire camps like these are where the inmates will do nearly all of their time. When they aren’t fighting fires they do community work, like building a flood barrier or setting up a park for an ice cream social. 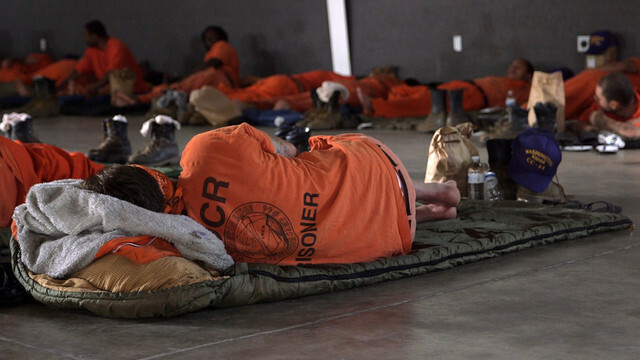 Once they're in the program they never spend a night in a prison facility. "It’s not just the walls you get rid of," says Michael Dignan, who's been an inmate firefighter for four years. "You learn a lot about yourself. You learn that there is stuff you can put yourself through that you never thought you would have been able to do." "When you think you’re done, you’re just not. When you see that last hill you have to climb and you tell yourself you can’t make it, you end up at the top of it," Dignan says. Dignan will need that kind of perseverance. He’s scheduled to be released in less than 30 days. He says he’ll go back home to Ohio and back to tree trimming; that’s what he did before being locked up. A few other men say they might try firefighting when they’re released, but most, citing the hot, hard work and long hours, say, "No way."